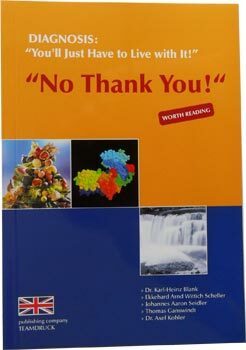 Rechts-Regulat Book DIAGNOSIS: You'll Just Have to Live with It - No Thank You! What Is the 'Bodys Enzyme System'? Despite modern medicine, the advances of our time have resulted in many illnesses that it is beyond our capabilities to cure. We are referring to the typical diseases of civillization: from sluggishness, insomnia, excess weight, skin problems and allergies to serious chronic illnesses such as diabetes, cardiovascular ailments, diseases of the stomach and intestinal tract, and the entire spectrim of autoimmune diseases. The main cause (apart from a frequent lach of spiritual orientaion) is a severe shortage of bodily enzyme groups(also known as low enzyme levels, or LEL), wich disrupts the human regulatory system. This method, which can be applied both internally an externally, offers humans an animals alike the opportunity to quickly restore their bodily enzyme supply to healthy levels. Even dentists report pain an faster healing.